Posted on July 16th, 2015 by Jacob. Nowadays it’s becoming increasingly difficult to keep up with technology, as it seems to be every five minutes that something new enters the market. But all is not lost as earlier this year the annual CES took place, revealing some of the plans from the world’s top tech leading companies. Contrary to last year’s event, the majority of companies have decided to build on their existing products instead of developing new ones. 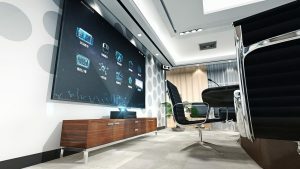 In regards to our favourite plastic rectangle, the TV, 3D is almost a thing of the past with companies like Samsung and LG spending their time on 4K resolutions. Samsung showcased their SUHD TV display whilst Sony displayed their Ultra HD TV displays, all said to create “Stunning contrast and striking brightness”. So this year we can expect to be wowed with near true to life images from the latest range of TVs rather then be jumping out of our seats with 3D. We can also expect future TVs to be thinner, and according to LG, curved. All becoming more common with the latest releases; and the same goes for smart phones as LG also took another crack at the curved phone (Flex 2) with various improvements such as a shorter charging time. But although TVs and other devices are moving away from 3D, the printing industry are embracing it and creating a number of futuristic gizmos such as the 3Doodler 2.0; a printing pen that allows the user to draw in thin air! That’s too much future for one day I think.